That’s the hypothetical question my husband and I ask ourselves each time we go into one of Whistler’s art galleries. But for some, this question might not be such a pipe dream. Whistler has over a dozen galleries, and this October five of them have come together to offer a new experience combining art and wine called Whistler Wine Walk. Dotted around the Village, these five locations will serve up delectable BC wine tastings and hors d’oeuvres, along with an interactive art experience each Friday during October from 5 – 7 PM. Expect artists live painting, demonstrations, and informal gallery owner chats as you sip and nibble on something yummy. This is the perfect date night idea, pre-dinner activity, or simply a lovely way to explore what’s happening in the world of art in Whistler. Enjoy the crisp evening air and fall colours as you slowly amble from each gallery to the next. This isn’t the time to rush. It’s all about taking a moment to think about colour, texture, form, and how it makes you feel. The five galleries are very different, and we reached out to each one to see what you can expect and what you should keep an eye out for when you go on your own, self-guided Wine Walk this October. Size does matter at the Teeny Tiny Art Show & Exhibit where over 70 artists from the Sea to Sky have created mini masterpieces – all under 3 by 3 inches. On the October 5 and 12 Wine Walks you’ll have the opportunity to make your own teeny creation, which can then hang on the group art wall or you can take it home as a Whistler memento. For the October 19 and 26 evenings there’s a change in programming to Living the Dream – Then and Now Photography by Carin Smolinski Exhibit and Short Films. The exhibit focuses on Whistler’s housing scene and features photographs taken back in 2010/11 capturing images of the “creative” living situations of Whistler locals – from squatters to closet dwellers and campers. Alongside the originals are the 2018 updates complete with information on pay, rent, occupations, and numbers of roommates. October 19 is the opening reception night so expect it to be buzzing as you take a look at how far people will go to “live the dream” in Whistler. The Maury Young Arts Centre is on the Wine Walk schedule for all four Fridays during October. The Adele Campbell Fine Art Gallery is known for its support of Canadian art and local artists. For three of the four October Wine Walks, they’ll be featuring an “artist-in-residence” who will be on-hand to answer questions, share some painting secrets, and demonstrate their techniques as they paint live in the gallery. October 5 will feature artists Susie Cipolla and Janice Robertson. Susie works predominantly in acrylics and is known for her landscapes and wildlife of the Pacific Northwest, look out for her piece “Sunlit Black Tusk” at the gallery. Janice is also an acrylics painter who focuses on the beauty of the west coast including florals, beaches, and forests. On October 19 it’s Dana Irving with her distinctive landscape style described as “Emily Carr meets Dr. Seuss,” and October 26 rounds out the Wine Walks with Valerie Butters’ explosions of joyful colour with her still-life and landscape paintings. Take note that the Adele Campbell Fine Art Gallery is not on the Wine Walk schedule for October 12. When strolling through the Upper Village, you can’t help but stop at Mountain Galleries as its windows are packed with incredible artwork from all over Canada. There’s sculptures, paintings, and furniture to take in, and the team there are passionate about sharing what they know about the artists they represent. For the month of October, the gallery has organized painting demonstrations by colourful animal painter, Shannon Ford; Andrea Moore with her incredibly expressive wolves and dogs; Doria Moodie’s imposing grizzly bears and vivid little skiers; as well as a presentation by Ellie Lamb, artist, Bella Coola naturalist, hiking and bear guide. It’s going to be an exciting time to visit Mountain Galleries, located inside the Fairmont Chateau Whistler and nicely positioned next to Portobello, which has a new smokehouse dinner menu and the some of the best sandwiches and donuts in town. The Mountain Gallery is on the Wine Walk schedule for all four Fridays during October. Alongside their stunning permanent collection, which includes nearly 200 pieces of coastal BC art from the 18th century to modern day, the Audain Art Museum brings in visiting exhibitions from all over the world. Opening on October 6, they’re going “down under” with Ancestral Modern: Australian Aboriginal Art from the Kaplan & Levi Collection. It will present a selection of contemporary art by Indigenous Australian and Torres Strait Islander artists. Made up of sculptures and paintings, viewers will see a connection with Western modern art as the artists share their distinctive culture. The fall ushers in another change for the museum, which will be open at the later time of 9 PM on Fridays enabling mountain adventurers to explore the galleries in the evening. For the October Wine Walk, the Audain will have an interactive art experience featuring a limited selection of works for you to enjoy, but please note they’re not on the schedule for Friday, October 5. If you’ve not already done so, you’ll want to come back and explore the whole museum! Located inside “Art Gallery Row,” which connects to the Hilton Whistler Resort & Spa, the Whistler Contemporary Gallery is a beautiful space to explore. Showcasing the work of emerging and established artists from Canada and around the world, take the time to explore landscapes, figurative paintings, and abstract pieces as you wander through. One of the pieces that caught my eye is the work of Max Steven Grossman whose “Bookscapes” each have a theme. The libraries don’t actually exist, they’re a digital composition made up of lots of different bookshelves, and it’s fascinating to read the spines and think about who would own a collection like this. Due to conflicting events, the Whistler Contemporary Gallery is only part of the Wine Walk schedule on the first Friday of the month, October 5 but if you’re passing at another point in time go in and take a look around. Hailey Elise: I always look forward to the fall deals, in particular, being able to enjoy the Rimrock Cafe’s menu. The flavours and service are beyond outstanding. I also love taking a trip to Creekside, it’s a treat to step outside the Village and into a cozy atmosphere where it’s just you, the wine, the food, and the company! Feet Banks: Alta Bistro. It’s small and intimate, and the menu is always bold, showcasing the culinary evolution in Whistler. The owner, Eric Griffith grew up here in the Village learning from the exec chefs at places like Il Caminetto and Araxi. It’s second generation fine dining with Whistler’s casual, friendly feel. I love sitting at the oyster bar at Araxi, and if I’m in a rush I know I’ll get great service and food at 21 Steps. However, Sushi Village has got to be my top pick for best menu and value. Nikkey Dawn: I look forward to going to Aura at Nita Lake Lodge in the fall. They have a seasonal menu with fresh local produce, and it’s vegan-friendly! They also have a great wine selection, and it’s a gorgeous spot to wander around before or after dinner to appreciate the fall atmosphere. 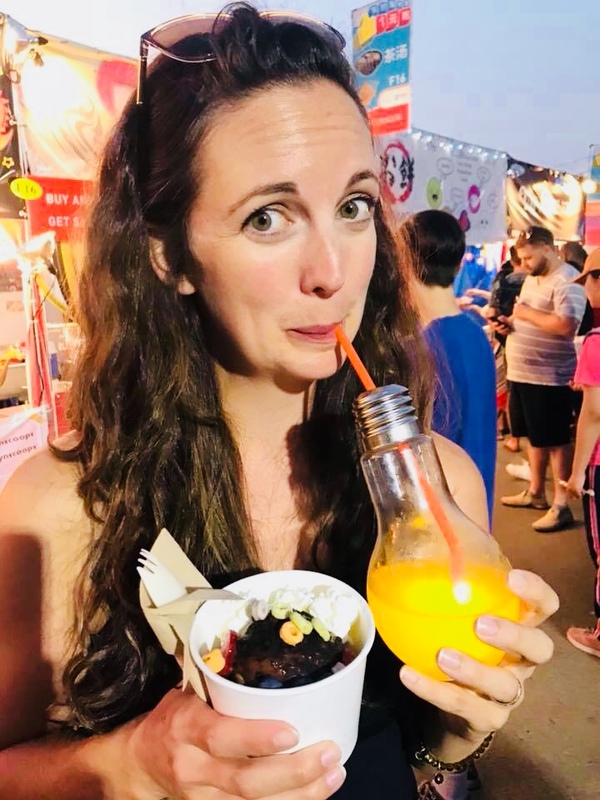 Blair Kaplan Venables: My husband and I always end up having our date nights at Sachi Sushi because we love everything about the culinary experience that they offer. I love their unique and fresh sushi rolls, and I’m addicted to their spicy agedashi tofu. Each meal always ends with Kani blossoms and a delightfully full belly. Megan Wilson: Going for a great steak dinner at Sidecut at the Four Seasons is on my ‘must do’ list every fall. The cozy fire-warmed dining room, and delicious, hearty food is just what you need on a cool fall evening. We look forward to seeing you this October for a Whistler Wine Walk! For more tips on where to dine, visit Whistler.com’s extensive guide, and just a heads-up that if you’re visiting Whistler over the winter season reservations are encouraged as prime dining times fill up very fast.